Cindibee's ART LAB | I slap my paint around. I’ve been thrown off balance by a change in routine. I’ve switched companies for my normal 9-5 and getting back into a normal and predictable work day has me utterly exhausted some evenings. Learning new things while also pulling on past experience and long-dormant skills can be a chore. Some nights I narrow my focus down to just getting to the gym and coming home for dinner, and screw the rest. Gym, shower, dinner, success. Then sleep. But still the creative urge continues on. Still I am drawn to my work space covered in markers and paints, papers and magazine clippings, beads and stencils and pretty pictures. Even if I do nothing but look and think, I still spend time in my craft nook, contemplating the meaning of color. I worried once that I wasn’t a good mother. I asked my partner if I was doing things wrong, messing them up and thus permanently scarring my child’s young and fragile psyche. He pointed out that the simple fact I worried so much proved how good of a mother I am. If I am always conscious of my progress and am actively looking for ways to improve, there is no way I can’t be a great parent to my child. My creative existence is the same. I worry and fear. I feel that creeping anxiety flood slowly into my brain and I ask myself “Am I good enough? Do I know as much as I wish I did? Do I have some type of unique vision that actually means something?” And because I fear, I keep pushing myself to be better. We are creative so we can place some sort of personal signature on the world around us. We want to feel proud of ourselves. We want recognition and to hear another ask incredulously “How did you do that?” These are our logical reasons. But mostly we are creative because we must be. Our higher thinking brains are too busy, too complex, too easily bored by routine and predictability. We are creative because it reminds us we are alive. I paint and draw and color because it makes me feel like a success. My time is not wasted. I drew a flower and declared it good, and I am enriched. I can go to bed happy that night. I tested out my homemade foam stamps and I am loving the patterns that came out! 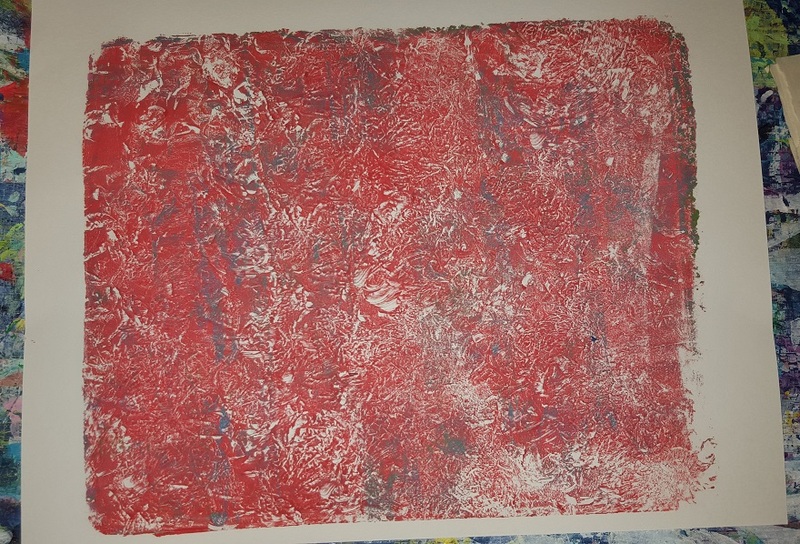 I cut some of my red rosin paper into rectangles and covered both sides with gesso so I could print on the paper. I still need to refine the bird stamp. I’m also experimenting with turning bath tissue rolls into stamps. I used Fast-Grab Tacky Glue to attach sections of cardboard tube onto some spare cardboard scraps. I can’t wait until these dry and I can test them out as well. The best thing about these recent experiments is that I’m reusing old materials. There is tons of stuff just sitting around the house that can be used like this! You just have to look for it. My work surface was covered by a tarp I cut down to size, but I recently purchased red rosin paper for a separate project, and I have an ungodly amount of the stuff. I mean, truly ungodly. This giant roll cost me only twelve dollars and I had NO IDEA of how much I would be getting when I searched for it at Lowe’s (who, by the way, doesn’t stock it anymore and I had to go to Home Depot ultimately to buy it). I can cut off this paper after it’s thoroughly used and abused, and I can use it in my art journal. Recycling is always awesome! I also bought some adhesive foam sheets to make my own stamps. Other artists have suggested the idea, such as Traci Bautista in her book Printmaking Unleashed, and Alma Stoller in one of her helpful videos. I’ll mess around with these beauties and practice some prints on some of my old book papers tomorrow. I’ll be sure to post the results. I love coffee and I am addicted to the ease of use of the Keurig. I was introduced to the one-cup wonder by my boyfriend and I have worshipped its convenience ever since. I also have a love affair with hazelnut creamer, and pairing it with my coffee brings the need for coffee stirrers. Did you know these things are terribly cheap and abundant? You can get 10,000 for about 30 bucks from an office supply store. No, I did not buy 10,000 coffee stirrers. I jacked a box of 1000 from my employer (with his blessing of course) because I had a fantastic idea on how I could use the stirrers in my painting. I also saved a cardboard box that used to contain a cord or whatever, and it was the perfect size for my idea. Some other scraps of cardboard from my recycling pile were useful as well. I used tacky glue to attach cut straws to the bits of cardboard, and now I have some fun stamps to use with my paints. I encourage you to look around your house and see what useful bits you can turn into printing material. I am absolutely LOVING the different colors and patterns I am getting from playing around with mono-printing on the Gelli plate and stenciling! Woah, 15 days since last posting. I’ve been super busy and time got away from me. Little One demands my attention and she begs to paint with me. Who am I to deny her? Good news is I’ve been very busy with art things! Way too much to include in just one post. I worked on a few pages in my 100% India journal. My intent was to get several pictures throughout the process showing how many layers I added, but I got a bit too caught up in the flow and only managed to remember to snag a few. This one started out with some layers of paint and some stenciling. After adding the face from a magazine, the page stayed fairly plain for a while before I just started sticking stuff on wherever I felt like it. Doodling with Faber Castell Pitt Pens and Molotow One4All paint pens brought this page to the next level. I’m done with it…. for now….. This next page was pretty much the same style. I worked on both pages simultaneously. A layer of pictures and scraps over a painted background. I like this style of just sticking things down and then doodling and then sticking more stuff down. Concentrating on the tiny dots and augmenting the individual elements with whatever drawing comes to mind really helps narrow my concentration to one specific step. I don’t worry so much about “how it will turn out” or “what direction I want to go”. The beauty is that there is no direction! Art is the experience more than it is the end result. Note: The 100% India journal started out as this book. I tore out about half the pages and Gessoed the rest. The paper itself was thick enough that I didn’t need to double up any pages. Now I keep this book handy and just open to a random page to use up some extra paint left on the palette, or to test out a new stencil, or even just to let Little One “scribble scrabble” (her words) to her heart’s content. Try this on your Gelli plate! This is Glade Press ‘N’ Seal. When you scrunch it up, it makes very interesting textures when dabbed on a Gelli plate. I love the lines and wrinkles produced on the paper. 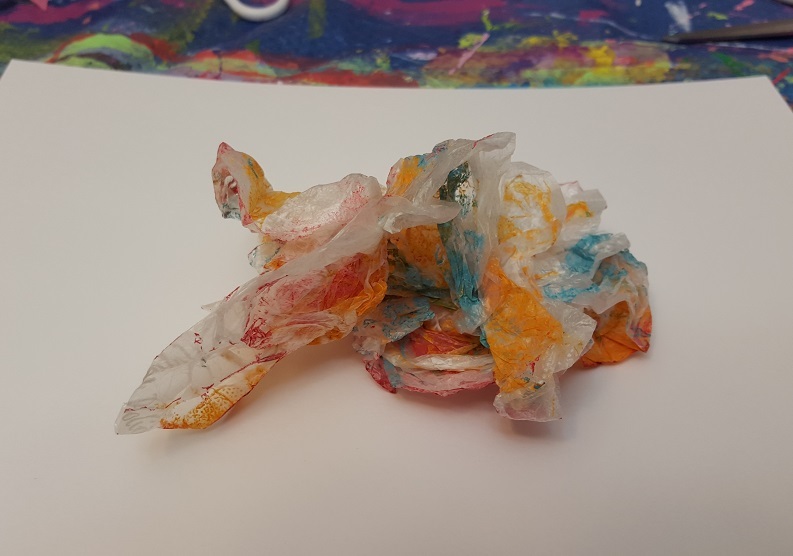 I’m going to be experimenting with more random items to see how they come out on the Gelli plate, and I’ll post the results here for you to enjoy!